See the beginning of the story. I video recorded my effort to put up the outdoor Xmas lights. The even distribution of electrical load must be considered and planned or suffer the same fuse blow up and extra work I had to endure last year. Today, my house of the last 10 years officially become another family’s home. The escrow closed today. I felt sad and would like to take this opportunity to reminisce and share some thoughts about this house. The house presented several challenges to me like several cases of “mini-flood” or puddle inside the dishwasher that I had to research and figure out how to fix, a leaking water heater that burst by a small thumb push, the toilet overflow and backup in the middle of night until a rooter hired by the city snaked from the rooftop (later we found the secret clean out buried under the decorative pebbles), the laundry sink with a poor flow that required several snaking attempts (this was how I sharpened my snaking/rooting skill), frequent caulking of tub and showers (this was how I became so proficient at caulking – each time last longer than the last), the loud banging/hammer of the water pipes upon turning on/off the faucet or sprinkler which forced me to painstakingly fasten and anchor the pipes in the crawl space, the sprinkler system that blew the fuses constantly – fixed by finding the wire short, and finally, the replacements of many parts (faucets, toilet valves, and etc.) and appliances (cook top, washer). We also improved the house by re-positioning the master room door, re-surfacing the floor, installing the skylight, sun tunnels, and new roof, re-organizing the master room closet, and planting the Fuji apple tree, and etc. We were able to enjoy the improvements. Farewell my friend! You have sheltered and served us, enriched our life, and taught us many lessons. Thank you. Getting a haircut is usually a not-so-pleasant experience for me because it’s hard to strike an interesting conversation with the barber beyond the usual “you live around here?” conversation during the haircut and the end result of my haircut invariably gets a thumb down from my wife and daughter. So I normally wait one or two weeks more than necessary to get a haircut. Today was no exception. Then the conversation turned into shopping for the kids as the school was about to start next week. I jokingly mentioned that with 5 kids, he could economized by using the hand-me-downs. “No,” he corrected me, “at their age (13 years old – his youngest twins), they don’t take hand-me-downs any more.” He even bought sneakers well over a hundred dollars a pair because “he’s really good at basketball” and they “compare among their friends.” Yap, the parents have to bear the burden of their children’s vanity. It’s hard for me to imagine having 5 kids in the family nowadays with a barber’s income, probably helped by his wife’s income. It’s a struggle nevertheless. As the conversation continued, I saw my hair was getting thinner and thinner. I shut up quickly for the fear of turning into a skinhead. As I walked out, I tipped Tommy an extra dollar and wished him good luck. It’s a good day after all. My lesson learned: There is always someone else had it worse than you do and they compensate with something else. Need not complain, just enjoy while you can. I have been spending last few weeks trying to get my house ready for sale. This is a house that we’re been renting out for a couple of years. After the tenants moved out, my wife and I decided to sell it in order to capitalize on the tax free exemption. Due to the drought, the tenant have been cutting back on watering resulting in yellowing of the lawns and plants. I had to first rescue the plants and lawn by increase the frequency and duration of irrigation. Somehow the personal interest overrides the public good of conserving water. Sorry. Then, I got the interior repainted by a professional painter. I also repaired window screen, vent cover and etc. and cleaned miscellaneous things like the dish washer, kitchen wall, and etc. Of course, as part of the local real estate tradition here I had to get the house inspected by a termite company (as expected, we’ve got termites) and a general property inspector for the roof/chimney, appliances and etc. The reports will be a part of the disclosure. Then we power washed the exterior stucco wall, which resulted in some paint damages. I hand to repaint and touch up some of the exterior wall and the decorative window shutter. This was no small effort due to the difficult in matching the color. To enhance the aesthetic, we planted lots of fresh, colorful flowers along the front walkway, and the backyard. The bare soil areas got covered with mulches – 15x 2-cubic-ft bags. The flower bouquet next to the front door looked extra appealing. It was both exhilarating and exhausting to “stress” up the house for a quick and hopefully profitable sale. The last thing we had to do was to hire a professional stage company to stage the house with beautiful furniture and decoration to pique the interest of potential buyers. You can see the end result in this virtual tour. The open house will happen on 8/23/14 and 8/24/14. I’m hopeful that all our efforts will yield good results. Jerky Brakes on My Nissan Leaf – How I Got It Fixed – Upgrade the App? 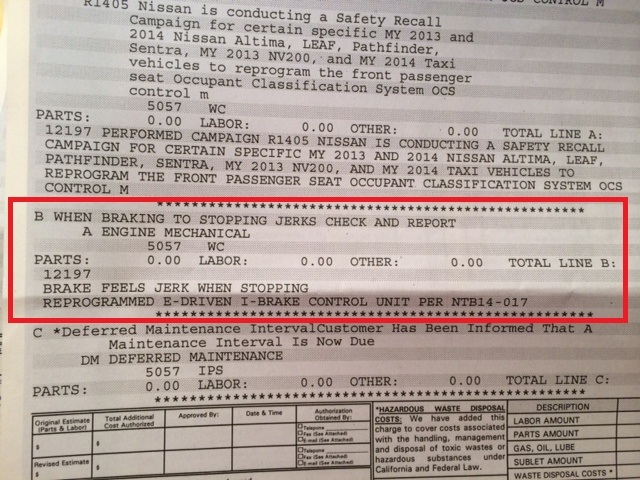 For several months now since I had my regular maintenance done on my 2013 Nissan Leaf, I have been experiencing very jerky brakes – sudden stop and jerk forward – driving my car. It’s like having an automatic-transmission car with super-fast idle speed and a digital(on/off) brake system. I felt bad as my passengers (my wife and daughter) kept complaining that I drove like a novice driver and it’s making them car sick. But no matter how hard I tried to soft peddle the brake, I would end up braking too short and when I let go slightly the car would jerk forward then stop. Or it would end up braking too slowly and I had to brake hard to avoid rear ending the car in front of me. It was an annoying and frustrating couple of months. I asked other Leaf owners, none of them experienced the same problem. I decided to bring the car to the dealership last Saturday (5/30/14) and was prepared to leave it there until Monday if necessary as the “Master Tech” wasn’t on duty to diagnose this complicated problem. Wow, little did I know that the braking system nowadays are more or less run by an on-board computer. That’s amazing! 1. If you encounter any car problems, search on Internet if there’s already a “service bulletin” outstanding that can address your specific car problem. I found that I could have found it on Internet and brought it to the dealership earlier instead of experiencing months of embarrassment. Make sure you have your car year/model and “service bulletin” key words. For example, for me it’s “nissan leaf 2013 service bulletin brake” for the Google search string. 2. More and more of the modern car or household appliances are run by computer. The upside is that the fix may be just a simple software upgrade and you’re back in business. The downsize that as the car is increasingly connected to the Internet as my Nissan Leaf is connected via 3G network, there may be more security/safety issues if someone can practically hack into your on-board car computer and cause a serious safety problem, e.g. by disabling the brake when you’re cruising on the freeway, and etc. The consequences could be deadly. It’s something we engineers need to pay special attention in our design work.